I’m pretty sure that the title of this post will catch your attention…and/or maybe your curiosity. Well..this is something I’m doing since years…and since did not cost too much to make it in a public and usable state, I decided to share my work, to help some people to avoid waste of time and to avoid to be angry when your cloud provider does not offer the gentoo image. So what are the goals of this project? Install gentoo everywhere in few seconds. To do a fast installation, we need a stage4….but what is exactly a stage4? In this case the stage4 is composed by the official gentoo stage3 plus grub, some more utilities and some file already configured. 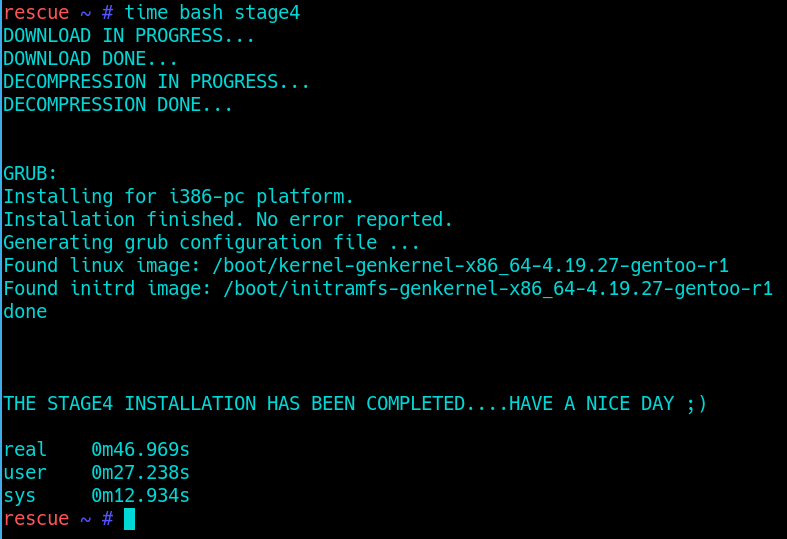 So since the stage4 has already everything to complete the installation, we just need to make some replacement (fstab, grub and so on), install grub on the disk………..and…..it’s done (by the auto-installer script)! A star on the project will give me the idea of the usage and then the effort to put here. This entry was posted in gentoo. Bookmark the permalink. What a blessing! The script works like a charm! No need to stay hours installing my boxes! Many thanks to you!